MOSCOW, September 29. /TASS/. The situation in Syria, including in Deir ez-Zor, was one of issues discussed at Friday’s meeting of Russian President Vladimir Putin with the permanent members of the Russian Security Council, Kremlin Spokesman Dmitry Peskov said. "The sides discussed in detail the Syrian issue, including the situation in Deir ez-Zor, also taking into account yesterday’s talks [with Turkish President Recep Tayyip Erdogan] in Ankara," Peskov said. The meeting’s participants also focused on "the continuing and growing pressure against Russian mass media in some foreign countries." "They noted that such steps against Russian media are unacceptable," Peskov said. The president also discussed domestic political issues related to Russia’s social and economic development. The meeting was attended by Federation Council (upper house of parliament) Speaker Valentina Matviyenko, State Duma (lower house of parliament) Speaker Vyacheslav Volodin, Presidential Administration Chief Anton Vaino, Security Council Secretary Nikolai Patrushev, Interior Minister Vladimir Kolokoltsev and Director of the Foreign Intelligence Service Sergey Naryshkin. On Friday, Putin is scheduled to have a range of other working meetings in Moscow. 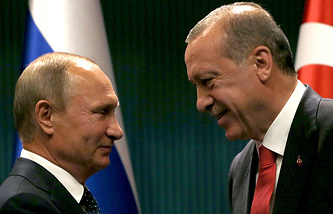 Putin paid a working visit to Ankara on Thursday to meet with his Turkish counterpart, Recep Tayyip Erdogan. One of the topics the two leaders discussed was the situation in Syria.